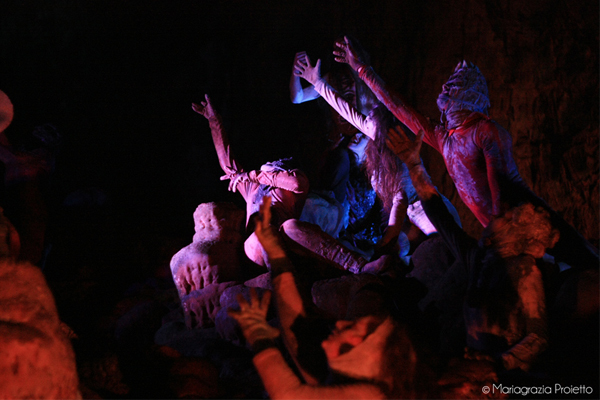 "Hell in the cave", a multimedia show dealing with the first Canto of Dantes 'The Divine Comedy' now playing in the caves of Castellana. "Being lucky enough to live right beside an important Karst topographical feature, the caves of Castellana, with its "Round hole" which draws our eyes upwards from underground to the sky letting us "see the stars again" and combining this with the most famous work of Italian literature was an exciting challenge, and one we just could not resist. 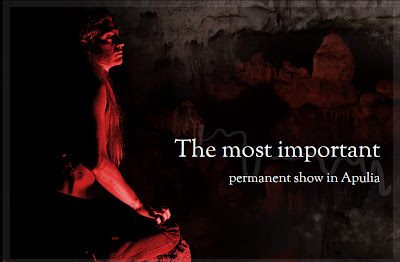 This stimulus has created "Hell in the cave", a multimedia show dealing with the first Canto of Dantes 'The Divine Comedy'. We also wanted to make this Literary masterpiece accessible to the public. The dramatic structure of the work does not allow any changes to be made to Dante's verses even though we have changed the structure of Dante's Hell, without the circles we would find in the original work. We have created a different hell where the damned are crushed in together, and meetings are dictated by the needs of the dramatic structure. The public will live with the characters of the Inferno, interact with them, share their feelings, and empathize with them for their suffering. We have chosen some of the most well known characters, highlighting the contemporary nature of their crimes: there is love, betrayal, envy, the desire for wealth, lust, misplaced heroism; we discover ties that bind fathers to their children, students to teachers, and Chancellors to their institutions. This is the Medieval world of course, because Dante is anchored in the culture of his time, but it is also incredibly contemporary, as mans feelings change little. They belong to all mankind for all historical periods and Dante shows us that he is an extraordinary connoisseur of humanity. It is not our intention to reproduce the Dantesque iconography to which we have become accustomed through Dorè's beautiful illustrations. 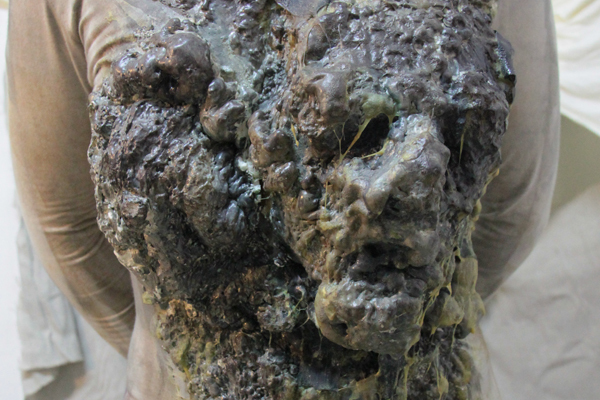 This is a free interpretation of the characters of the damned and the demons, who will reflect our deepest fears, which could perhaps visit us in our nightmares and might represent illness and disease which frightens us. On the contrary to the traditional image of Dantes demons, Lucifer, ruler of this kingdom, is the only figure which takes human form: the audience will have to draw their own conclusions from this difficult choice. The audience enter the hellish cave by the tunnel and through a speaking door which reveals the entrance to this "Woeful city". Two Twin Demons take visitors into hell and also play the role of master of ceremonies playing the character of Charon who rebukes bystanders. Minos compels the damned and spectators to take their places in their new home. Lucifer appears and leads everyone in a hellish dance. 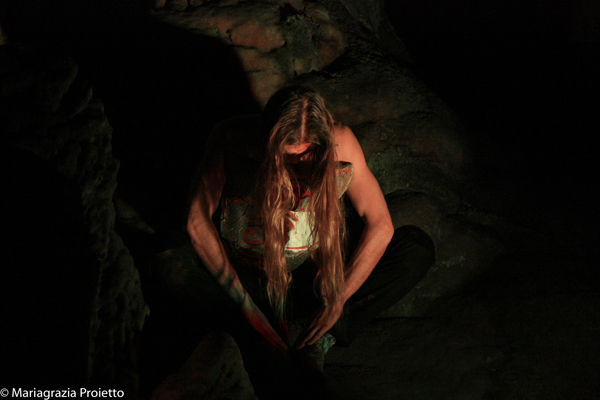 Pier delle Vigne is the first famous damned soul to tell his story to the public. Then Chaco, Francesca da Rimini, hovering in the air with her lover Paul,The Simoniacs, Pope Nicholas III, Count Ugolino, Brunetto Latini, the Hypocrites and Ulysses, the most heroic damned soul of the work. Minos compels the damned and spectators to take their places in their new home. Lucifer appears and leads everyone in a hellish dance. Pier delle Vigne is the first famous damned soul to tell his story to the public. Then Chaco, Francesca da Rimini, hovering in the air with her lover Paul,The Simoniacs, Pope Nicholas III, Count Ugolino, Brunetto Latini, the Hypocrites and Ulysses, the most heroic damned soul of the work. Lucifer gathers all the demons together. He knows full well what his kingdom is like. He was the Lords favourite angel before being cast down into hell. He wanted knowledge, to be godlike , to push the limits. Now he must govern the damned and hold the demons at bay while the public symbolically return to salvation following Beatrice back to the "bright world.""